Last month I was asked to write a letter of support for the restoration of The Empress. The ongoing destruction of venerable movie theatres has long been a sore spot with me. Montreal has had a particularly shabby history of letting these heritage sites—even after they’ve been declared culturally significant—fall apart and eventually die by the wrecking ball. For the record, here’s what I wrote. Montreal’s cinema heritage is dying. In my lifetime, I’ve watched most of the grand old theatres on the island shutter their doors and get torn down, chopped up, or reduced to a facade for retail stores. It breaks my heart every time. These were the screening halls I grew up in. This was where I spent so much of my youth, in the dark, absorbing cinema from around the world and a dozen past generations. These were the places where I learned what I wanted to do with my life. I’ve worked in the film industry for my entire career. Recently, I published my first novel. It’s about movies and my love of film. So is the second one coming out later this year. Such is the impact cinema has had on my life—impossible without places like The Seville, The Rex, The Loew’s, The Kent, The Palace and The Paris to bring me in. All of them are now lamentably gone, obliterated beyond restoration. But The Empress still stands. Perhaps the single most important movie theatre of my youth, during its stint as the Cinema V repertory house, The Empress introduced me to James Bond, Alfred Hitchcock, John Waters, the Universal Studios monsters, Jerry Lewis comedies, Vincent Price thrillers, red and cyan 3D, Odorama, The Rocky Horror Picture Show, Canadian genre pictures, cartoons for adults, and friends I’ve kept for decades. It’s one of the very last of its kind, and one of the finest examples—not only in this city, but in the whole country. Spare it the axe. Save it for those who remember its glory days, and those who will experience all it has yet to offer. The Empress is also dear to me because it’s just a short walk away from where I live now. The idea of one day being able to pass through its doors and watch a movie again fills me with joy. The prospect of watching it being turned into condos, or worse, an empty lot, fills me with dread. 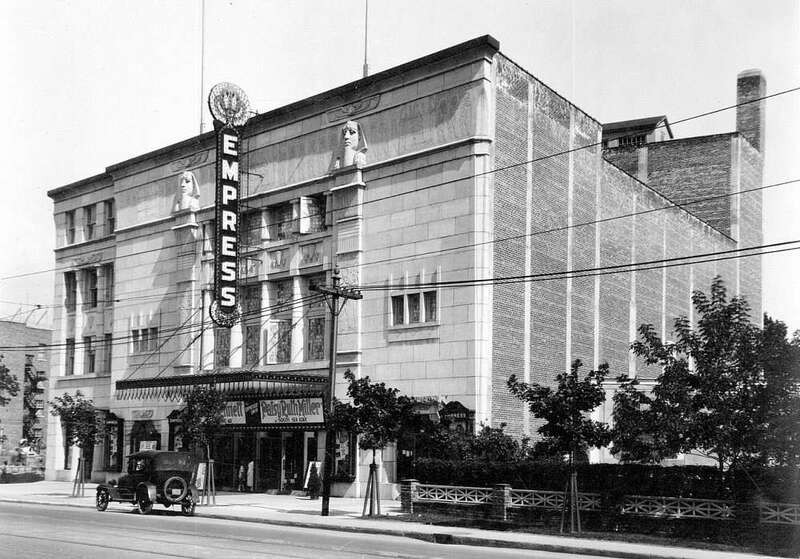 The Empress in 1928, the year it opened. Check out this recent article about the ongoing effort to save it, or visit the project home page for more information and pics of the beautiful old lady. I barely remember its Empress incarnation, but the Cinema V? Great memories! I still miss it. I was impressed at the time (early ’90s) that it managed to show Henry & June, a rather X-rated film – featuring an impossibly young Uma Thurman. Sign up now and receive free books, exclusive previews, and special discounts.